When the D.C. Zoning Commission voted in September to support Forest City’s plans for the open lots at Fourth and M, our neighborhood gained more than just two more apartment buildings and ground level retail. 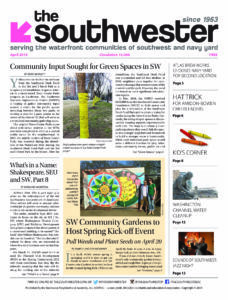 As a result of some hard negotiations on a Community Benefits Agreement by ANC-6D, Southwesters will soon have something many of us have wanted for a very long time: our very own Community Center. 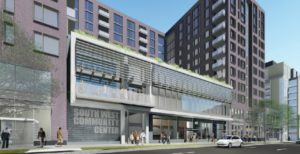 The Community Center will be located in the heart of Southwest at 375 M St., SW and housed within the first of the buildings to be constructed. It will front directly on M St., with a ground level accessible entry leading up to 6,000 square feet on the second floor, and access to an interior private garden space. Forest City is providing this space rent-free for 30 years, paying all utilities associated with the operation, contributing a one-time payment of up to $500,000 for the Community Center’s interior design and fit-out, and will provide up to $50,000 for furniture, fixtures and equipment. Even though they will not start digging on the lot in front of Safeway for at least another year, and it will take another two years to complete construction, ANC-6D has begun the conversation now about how to achieve a shared vision of what we all would like to see in our new Community Center. It is going to require considerable effort from every corner of the neighborhood over the next three years to build the kind of operation that will truly be able to serve the interests of a community as broad and diverse as ours. The initial vision is for a space filled with educational enrichment programs that span a wide array of subject matter. The Center will strive to provide a range of opportunities for intellectual engagement, personal growth and social connection. It will be a place where everyone in Southwest can gather to exchange ideas, share their talents and pick up some new ones. Interested in a cooking class? Learning to sketch? Want to explore the history of jazz? Need practice for those college entrance exams? A place to hold your men’s group? Yoga anyone? Or perhaps you always wanted to play the guitar. Right now, it is all a blank slate and the chalk is in your hands. Our Community Center will be Southwest built and Southwest run. It will not be a D.C. government operation. That means we are going to need input and involvement as this project takes shape. ANC-6D has hired a part time Interim Executive Director, Andrea Gilliam, to help with development and engage neighbors prior to holding a large community meeting early in 2019. For more information as it becomes available and to get on the mailing list, please send your contact information to swcommunitycenter@anc6d.org. If you are a member of a community organization and would like to schedule an introductory meeting with Andrea, please find a time that is convenient for you by using the following link: https://calendly.com/andrea-gilliam/community-center-introductory-meeting. We look forward to your participation. It is going to be a great adventure!